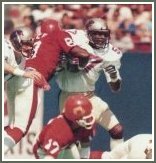 Each year, two sets of awards were given to players, coaches and executives in the USFL. One set came from the league itself while the other came from the Sporting News. For each year I have listed the league award winners first followed by the Sporting News selections.